This challenge is getting harder, I'm running out of ideas slowly of where to get some of these beers. I have got a few lined up over the next couple of weeks though, so there should be a steady supply of reviews to follow. Anyway, I have a Slovakian lecturer at uni and this is the beer he suggested, better be good! Zlaty Bazant is the premier beer in Slovakia. For our American friends this beer is marketed at Golden Pheasant in the United States, which is the translation. I love a good Czech Pilsner and am really looking forward to this beer. Tomasz promised me lots of bite in this beer, and I am expecting lots from this beer. This is an excellent looking beer! The colour is a nice deep gold colour with excellent carbonation rising to a thick white head of solid looking foam. The head is at least 2 and a half fingers high, perfect for the style. The golden pheasant is really living up to it's name in this beers brilliant colour. Spectacular looking beer, personally I couldn't ask for a better looking pilsner, bring this beer on! On the nose this beer has lots of grassy and floral hops upfront. It basically smells like your typical pilsner, normal lager yeasts, good malts and nice biting hops. I can also smell a mild citrus aroma, which seems to help balance this beer. I can't pick the variety of hops used in this beer, which is unusual for me, but they appear to be of a high quality. With how this beer smells it should take fantastic! The Slovakian's certainly know how to make a good beer! This beer is going to do really well if I end up ranking these challenge beers at the end. 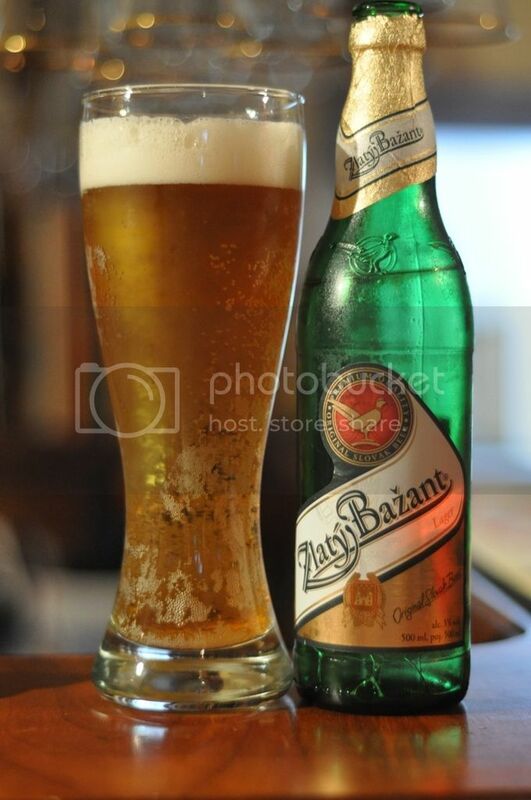 Zlaty Bazant is a true Czech pilsner, true to the original values of the original brewers in Plzen. The beer starts off with slightly sweet malts (almost honeyish), which is slowly overtaken by a lemony-herbally hops. The hops are brilliant and very bitter in the true Czech style. A brilliant tasting beer!! Hello Noz! Thank you very much for the info! I'd love to get some of this - to impress a girl;) - I see you're in Vic - but would you know anyone who could help getting - even a box - of this!? Thank you! Hi where in Western Sydney can I find this fantastic beer? I don’t mind if it comes in cans or bottles (actually I found that the cans taste better which is not usually the case for most beers) any help would be great.